Alright, don’t get squeamish on us. This isn’t some crazy speculum shot of Dave’s eye, though that was the first thing that crossed my mind when he sent over the pics. This is a photo, taken through the bottom of a drinking glass, of a (totally separate) photo of Dave’s eye displayed on the background of his iMac screen. Shot with his iPhone 3GS. Check out the upper right. See the folder icons now? Freaky cool, eh? Dave was working away at the computer, chugged the rest of his water, and as the glass was coming down he caught a glimpse of his screen background, which inspired many more shots through the drinking glass. And that’s how Dave sees world, yo. 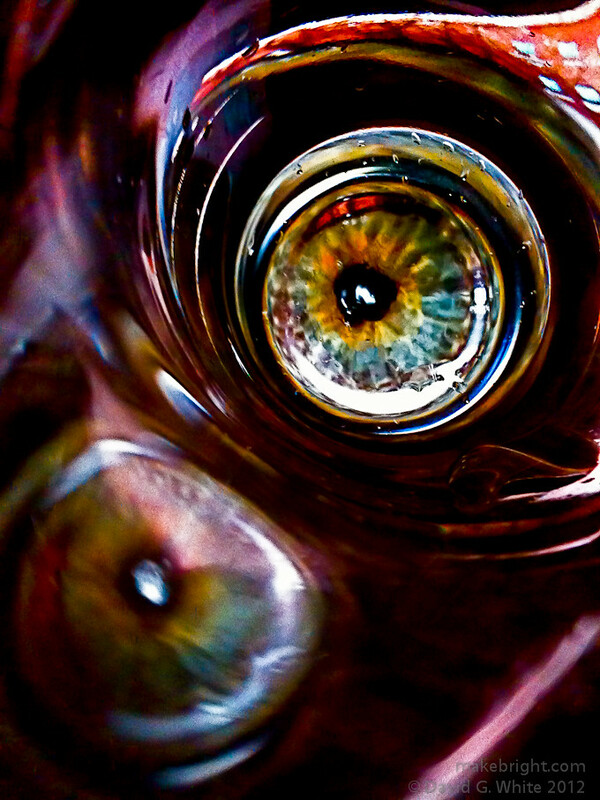 This entry was posted in photography and tagged DGW, eye, improvised lens. Bookmark the permalink.